The vendor released its Encore Mini tablet and two new L-series Satellite notebooks running windows and powered by Intel processors. The latest addition to Toshiba’s encore tablet range, the 7-inch Encore Mini uses Windows 8.1 and comes with a one year subscription to Office 365 Personal. It also has a terabyte of OneDrive Cloud storage for sharing files between Windows-powered devices. The 16GB tablet weighs in at 345g and is just over 1cm thick. Toshiba said it has been optimised for one-handed operation. The unit is powered by the newest Intel Quad Core Atom processor and features a multi-touch display. The Encore Mini is priced at $AUD199 and $NZ219. Toshiba’s two new additions to the L-Series notebook range are touted as ideal all-round devices if you need a versatile companion that offers more power and mobile performance. Both notebooks run on Windows 8.1, use Intel integrated graphics and feature 802.11ac Wi-Fi. The convertible 11.6-inch HD touchscreen notebook, the Satellite L10W, features a dual hinge that allows the screen to be moved 360 degrees. 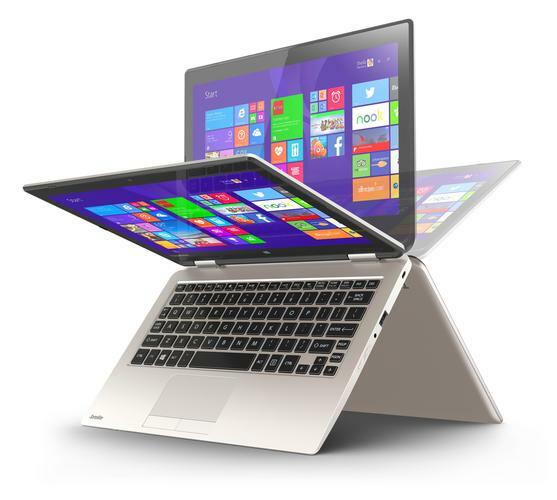 The company claims it is the first five-in-one convertible notebook. It features an Intel Pentium N3540 Quad Core 2.16 GHz - 2.66 GHz processor, 4GB DDR3 memory and a 500GB mechanical hard drive. It isn't the most powerful hybrid notebook on the market, but it is clearly designed for flexibility and not power. The L10 Satellite is a more traditional ‘clamshell’ notebook offering more power, sound and connectivity options. It comes with built-in features like dts sound and mobile connectivity options. It also features an integrated Windows service including Windows Store, Skype, Bing Search, OneDrive and Xbox. The notebook is powered by an Intel Celeron N2840 Dual Core 2.16GHz - 2.58GHz processor and has a 500GB mechanical hard drive. However, when it comes to memory, the L10 is underpowered compared to the L10W, with only 2GB of memory, which is a bit of a disappointment. The Satellite L10W is priced from $AUD699 and $NZ849. The L10 is priced from $AUD420 and $NZ450. The new range of products is available now through selected retail outlets.